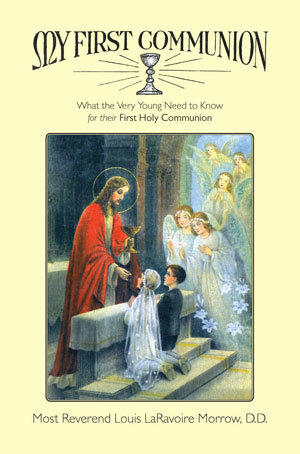 First Holy Communion: A Moment of Divine Love - A Day of Celebration This activity book will help you prepare your child for the sacrament of First Holy Communion. It covers: Symbols Scriptural References Preparations Spiritual Preparations Family Activities - Decorations and Gift-Making Celebrating with Symbolic Foods Ceremony and more! 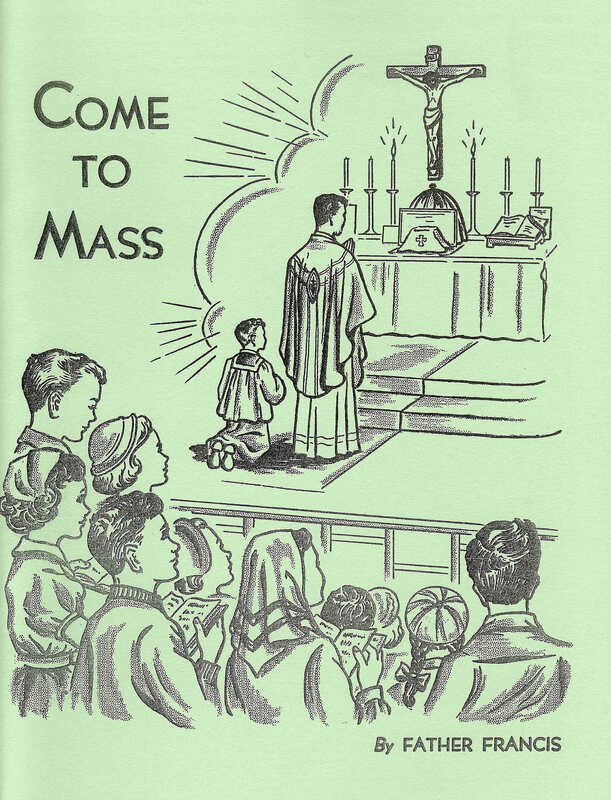 Reprint of 1954 publication describing reverence for the Holy Sacrifice of the Mass and all necessary components of the Mass. Recommended Age: Fourth Grade and up. 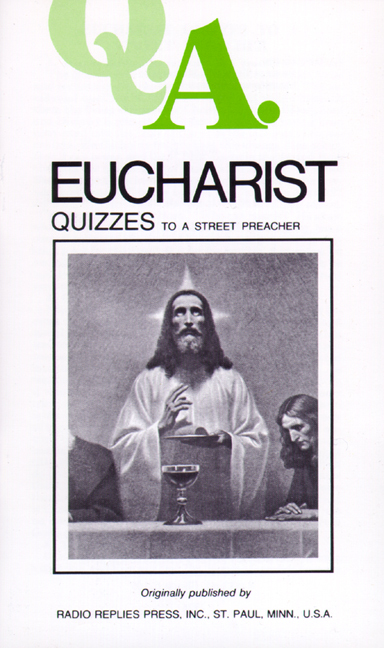 EUCHARIST QUIZZES Quizzes to a Street Preacher By Frs. 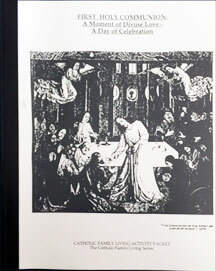 Rumble and Carty 67 Questions and Answers on the Holy Eucharist--the Real Presence of Christ, Scriptural basis, Transubstantiation, the Mass as a sacrifice, Communion under one form, the state of grace as a requirement for receiving Communion, the results of frequent Communion, lack of spiritual improvement from frequent Communion, etc. 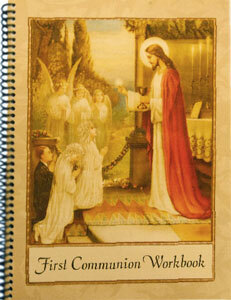 This is a complete and easy to follow catechism for children preparing for their First Holy Communion. 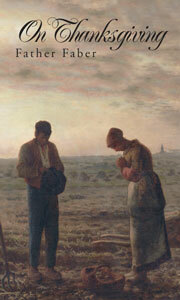 It is based on the Baltimore Catechism. This spiral bound book has numerous illustrations throughout its 88 pages. 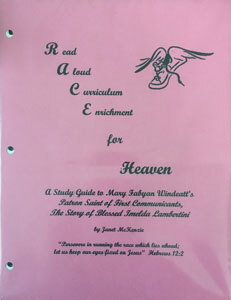 Based on the Baltimore Catechism, the workbook coincides with the First Communion Catechism compiled by the Daughters of Mary. 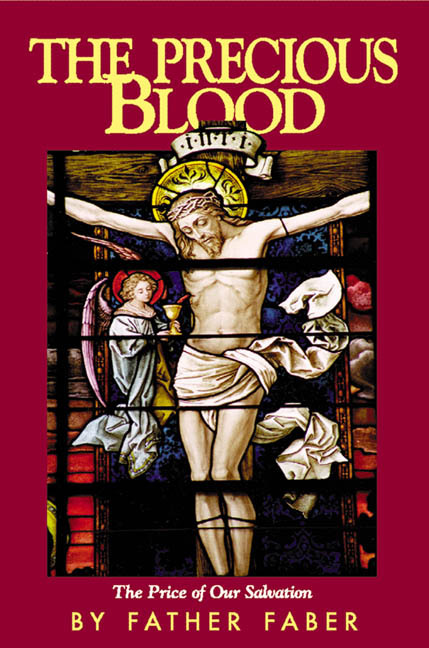 Colorful prayer booklet with meditations, quotes and prayers of the Saints on the Holy Eucharist; short stories about the Saints especially devoted to the Blessed Sacrament. References to over ninety saints. 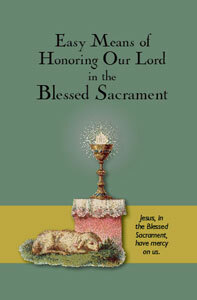 A helpful companion for Eucharistic adoration. Softcover, 78 pages, over 70 full color illustrations. from the Writings of Father Frederick W. Faber. 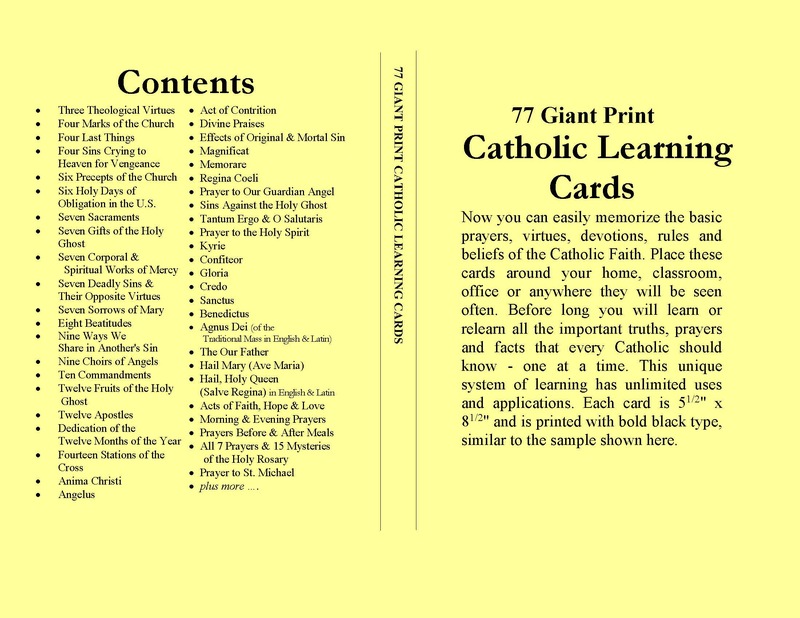 Chapters include: Neglect of Thanksgiving, the Spirit of the Saints a Spirit of Thanksgiving, Various Subjects for Thanksgiving, Thanksgiving for the Gift of Faith and other chapters on the subject. 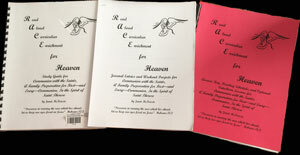 149 pages, soft cover, 5" x 3.5". 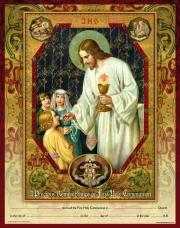 Blessings on your First Communion Day! 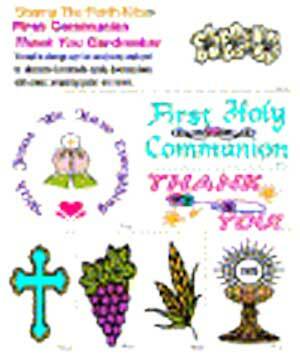 Wood Size = 2.5" x 1.75"
Make your own First Communion messages for family and friends. 7 quality stamps, 8 heart shaped cards/env. 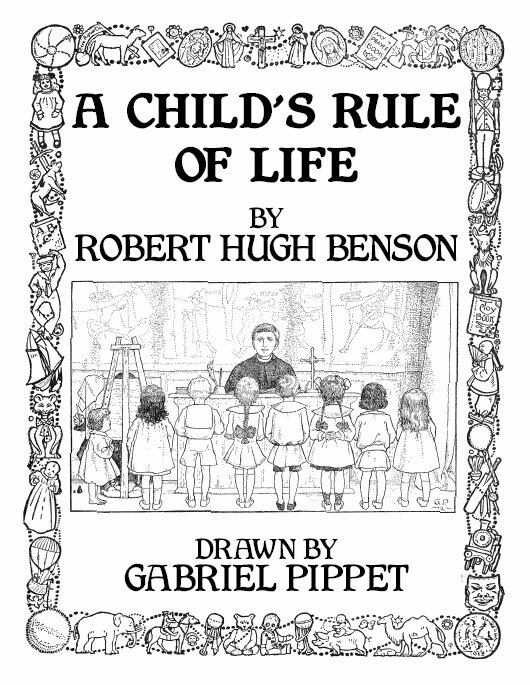 First published in 1950. 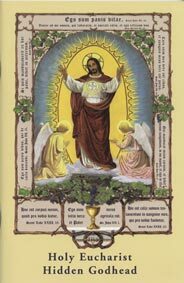 Jesus our King comes to us in Holy Communion. Excellent preparation for First Holy Communion. Recommended Age: Second Grade and up.